Also Called: Frenchweed, stinkweed, fanweed. Stems: Erect, solitary or several, branching above, glabrous. Leaves: Alternate, simple; basal leaves spatulate to oblanceolate, 1 to 4 inches long, tips rounded, margins irregularly toothed or entire; stem leaves oblong-elliptic to lanceolate, 1/2 to 3 inches long, sessile, tips pointed to rounded, margins coarsely toothed. Inflorescences: Raceme, multi-flowered, terminal, elongates with maturity. Flowers: Numerous, small, short-stalked; sepals 4, egg-shaped, less than 1/10 inch long, greenish-white, sometimes lightly pubescent, tips blunt or pointed; petals 4, spoon-shaped, white, 1/12 to 1/6 inch long; stamens 6, nearly equal. Fruits: Pod, compressed, oval to nearly circular, 2/5 to 3/4 inch long, tip notched, valves 2, each with 2-8 seeds; stalk 1/4 to 3/5 inch long; seeds oval, somewhat flattened, purple or black. Habitat: Open waste areas, roadsides, grain fields, and gardens. Distribution: Throughout Kansas, but rare in southwest corner. 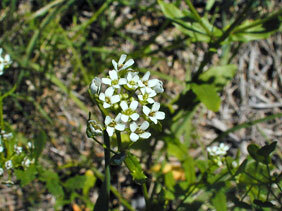 Toxicity: Pennycress has been known to cause poisoning in livestock. Signs of poisoning are digestive disturbance, bloody diarrhea, and photosensitization. Comments: The seeds can remain viable in the soil for many years. Will cause milk to have a bitter, garlic-like taste.